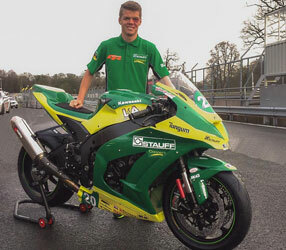 Sheffield-based GR Motosport has signed Kawasaki’s former Superstock 600 Champion and Supersport race winner, Mason Law, for its return to the Superstock 1000, aboard the all-new STAUFF Connect Academy Kawasaki ZX-10RR. Tungum Ltd, Gloucestershire-based manufacturers of corrosion resistant tubing, sponsored the GR Motosport team in the 2016 season and will continue its support this year, with riders Tommy Bridewell, British Superbike, and Mason Law, British Superstock, leading the charge. Mason, a 21-year-old from Benfleet, Essex, will race the 2017 Kawasaki ZX-10RR in the all new format Pirelli National Superstock 1000 Championship under the guidance of former Grand Prix and British Championship winning Team Manager, Geoff Crust. “I’m delighted that I can finally talk about my deal to ride Kawasaki’s all-new ZX-10RR in this season’s National 1000cc Superstock class with the STAUFF Connect Academy,” commented Mason. Law and Bridewell will be joined on the team by 16-year-old Liam Delves. The youngster, from Stechford in Birmingham, will compete in the Hel British Motostar Championship series this year on a brand new British-built DR-Moto superbike following a partnership between GR Motosport and Reynolds Engineering Ltd to develop a Moto3. The opening round of the 2017 MCE Insurance British Superbike Championship takes place at Donington Park on 30 March – 2 April. For further information, please visitwww.grmotosport.co.uk and www.britishsuperbike.com.